Dig Into Geology > Ask-a-Geologist! Mini Me Geology's professional geologist, Tracy Barnhart, is on stand-by to answer your most burning question. Click here to ask your question today and you will soon see it in a video! You can see our current videos here. We answered some of our questions in the links below before we started our video answers so you can browse these sections for more great questions too. We will soon transition these questions to more in-depth video answers as well. 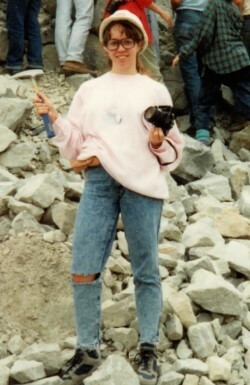 And, yes, that sad picture to the left is Tracy (yep, me) many, many years ago on a field trip at a tin mine in Canada. Don't you just love the hard hat and safety glasses? !